SHIPPING: Truck shipment item. Use FREIGHTQUOTE for shipping rates. OPTIONS: Available in 16 to 40 foot models,, Type 1AA 375 lbs rating, single type, and aluminum. CATALOG OF OPTIONS. 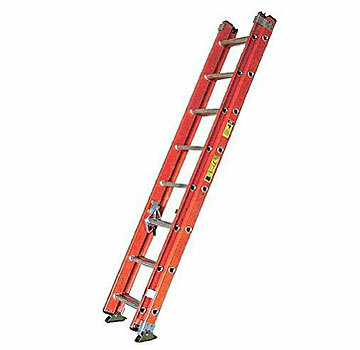 LADDER STABILITY ANCHOR / TIE-OFF KIT. ATTACHES TO FACIA OR RAFTERS. CLAMPS UP TO 2-1/2 INCHES WIDTH. INCLUDES BOTH 2 AND 3 FOOT STRAPS. PRICE/KIT.